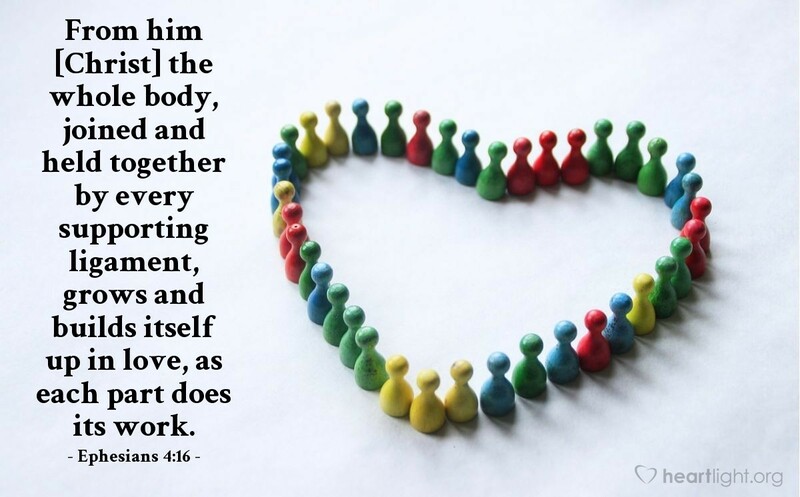 From him [Christ] the whole body, joined and held together by every supporting ligament, grows and builds itself up in love, as each part does its work. Ephesians and Colossians emphasize that no human being, or even group of human beings, is head of the Church. Jesus is head of the Church. He sets our direction. He is our example. He is our goal for ministry. In addition, Jesus also arranges us in his Body as he chooses, gives us gifts to use to bless each other and God, and holds us together so that we can effectively serve as his presence in the world. So let's set our hearts on Jesus. Let's use his life and love to inspire us and show us how to serve. Let's give him our allegiance and loyalty. He alone is head of his Body, the Church. Let's let him lead! Righteous Father, thank you for Jesus. Thank you for his example, service, obedience, love, and sacrifice. Thank you for his resurrection, exaltation, power, and presence today in your Church and in my life. Father, please use me, and my brothers and sisters in Christ with me, to do his work in our world and share your grace with all who are lost. In the name of the Lord Jesus I pray. Amen.